The Associated Press reported Saturday afternoon that fired former FBI Deputy Director Andrew McCabe kept memos of his dealings with President Donald Trump, similar to those kept (and illegally leaked) by fired former FBI Director James Comey. 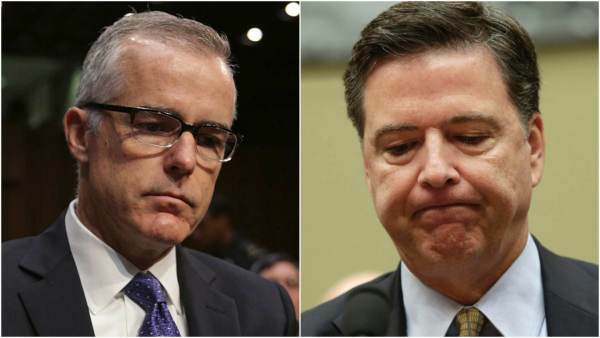 McCabe and Comey, both fired, both kept memos on dealings with Pres. Trump. The AP report states it is not clear if McCabe’s memos have been shared with the Mueller investigation. Andrew McCabe, the onetime FBI deputy director long scorned by President Trump and just fired by the attorney general, kept personal memos regarding Trump that are similar to the notes compiled by dismissed FBI chief James Comey detailing interactions with him, The Associated Press has learned. It was not immediately clear whether any of McCabe’s memos have been turned over to special counsel Robert Mueller, whose criminal investigation is examining Trump campaign ties to Russia and possible obstruction of justice, or been requested by Mueller. McCabe’s memos include details of interactions with the president, among other topics, according to a person with direct knowledge of the situation who wasn’t authorized to discuss the memos publicly and spoke on condition of anonymity. End excerpt. Please read the complete AP article at this link. Fox News’ Adam Housley posted several tweets last night on McCabe’s firing, including one in which he reported that his sources told him McCabe threatened to take people down with him if he was fired. The post Breaking Report: Like Comey, Fired McCabe Kept Memos of His Interactions With Pres. Trump appeared first on The Gateway Pundit.